The Yorkshire city of Leeds has had three greyhound tracks in the past, the one on Elland Road opposite the football ground was situated at 1° 34' W 53° 46' N. It operated under NGRC rules throughout its history, opening on 16th July 1927, with racing being administered by The Leeds Greyhound Association Ltd under the Chairmanship of Alderman H. Morriss. The track had a circumference of 414 yards and operated a Metro-Vickers electric hare. In 1931 it raced on Monday, Wednesday, Friday and Saturday evenings. 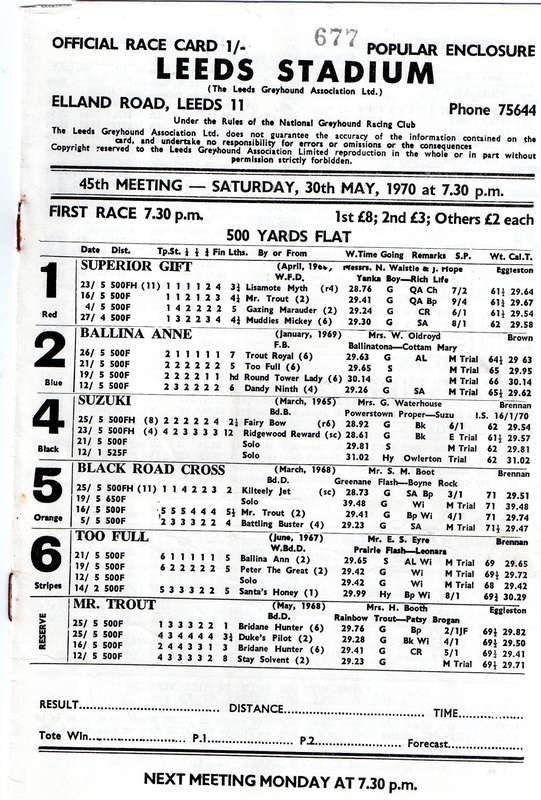 In the early days it held sprints over 293 yards, standard races over 492 yards and distance races over 707 yards. It closed its gates for the final time on 1st March 1982. Track Records, as of 1947, are shown below together with an indication of how fast the time is in comparison to other tracks, both for currently open and defunct tracks, in the UK. Ratings are between 0 and 100, where 100 is an extremely fast time and reflects the speed of the track, tightness of the circuit and quality of greyhound visiting the tracks. I am extremely grateful to Tony Nash for providing the data.